The delay in putting into operation of the first two units of the Kudankulam nuclear power plant built in Tamil Nadu with Russia’s help costs the Indian budget Rs. 50 million or 1 million USD on a daily basis. S.A. Bharadwaj, the technical director of the Nuclear Power Corporation of India Ltd (NPCIL), announced this figure. According to Bharadwaj, over the six months of forced delay the overall cost of the project grew by Rs. 10 billion. In reality, the true cost of the delay in the construction of the nuclear power plant is even greater. The entire South of India is facing severe shortage of electric power. Its industrial development is being stalled. It is clear that the authorities cannot postpone the opening of the power plant forever. 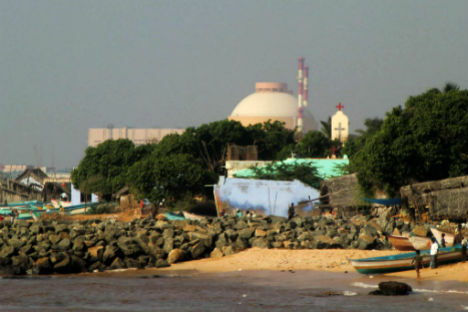 An NPCIL representative believes that «the decision to put the Kudankulam nuclear power plant into operation can come any day». In his opinion, all issues of security raised by the protesting NGOs and activists have been reviewed and resolved by a group of experts specially set up by the Government. After the local authorities give their approval, it will take another six months before the first 1000 MW reactor will produce the electric energy, says Bharadwaj. The second unit can be put into operation in 8-9 months. «The Kudankulam power plant is still in good shape despite the spontaneous demonstrations and the siege», stated the NPCIL representative. «Besides that, due to such a long break most Indian and Russian subcontractors have left India and now the NPCIL has to call them back. This will also take some time». The Indian official also added that besides the reactors already built in Kudankulam two additional reactors of similar capacity of 1000 MW each are scheduled for construction. The Indian Government has always considered nuclear power projects a high priority, including the construction of the Russian –Indian nuclear power plant Kudankulam, - says Anton Khlopkov, the director of the Center for Energy and Security of Russia. «I would like to point out that given the absence of significant deposits of oil and gas in India, in the near future there are no alternatives to nuclear energy in that country. Moreover, India is one of those countries that are beginning a massive development of nuclear energy production and that possess a significant technological, scientific and human potential in this area. That is why those considerations that the local population in Kudankulam has are primarily the result of inadequate work of nuclear energy representatives with the local population who let the people be misled». But is this the only cause? The market size of the nuclear energy generation in India is estimated at 150 billion USD. Almost all countries with nuclear technology participate in the competition over this market. An acute fight is taking place. Only Russia has achieved concrete results: two units have been built and are ready for launch at the Kudankulam nuclear power plant. Could that be the reason why the West has transferred 7 million USD to the NGOs that were the loudest in protesting the nuclear energy generation? Four of them have been banned in India. 16 other NGOs are still under investigation. In his recent interview to the American “Science” magazine India’s Prime Minister Manmohan Singh made a direct statement that the NGOs fighting against nuclear energy do not appreciate India’s requirements for increased electric energy production.